Irish Beer Dinner with the Chubby Cook! I had such a good time at the Beer Pairing Ladies Night with The Chubby Cook, we’ve decided to do another event. Make plans now to attend our Irish-themed beer dinner on Friday, March 16th! This is more than just a pairing/tasting, this is a hands-on cooking class with Scott Groth, the Chubby Cook himself–I’m providing the beers to go with his wonderful food. This lucious dip is served up with a delicious beer bread we will make together! A hearty and classic dish which is satisfying and easy to assemble. Delicious bone-in chops cooked to perfection on the grill. 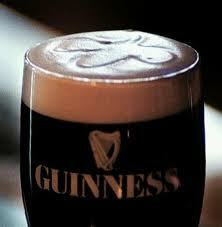 Combine a dark chocolate pudding and Guinness topped with a light, Guinness flavored whipped cream in a pint glass. It’s $55 per person, call 216.342.4840 for your reservation! Slainte!